Center Stage Lighting and Rigging provides and implements top-quality lighting for your event. Experienced professionals in stage systems work with your venue and turn your expectations into a dazzling show. Your stage will be prominently shown, safely illuminated and displayed with terrific color and brilliance. Stage lighting equipment is as important as sound in any performance or demonstration. Seeing your artist or presenter is essential for your audience to connect and enjoy your performance. 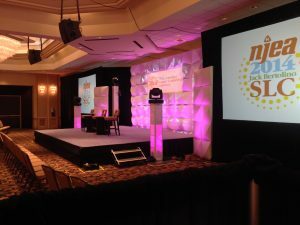 For professional presentations, speeches, awards and other events, the Center Stage stage lighting design team arranges bright stage lights that won’t interfere with your slideshow or distract your presenter. For bands and other entertainment performances, colored and white spotlights give the show movement and a new dimension of excitement. Center Stage’s lighting and rigging experts help you design the ideal lighting arrangement for your event, either working with your existing equipment, bringing equipment rentals or supplying led stage lighting and equipment for sale. Center Stage supplies top names in the entertainment industry to make each show extraordinary. For more information on lighting design and equipment, call Center Stage Lighting and Rigging.